A good workman like kit of this US MBT circa early to Mid 90s . Excellent value for money and a good balance of detail vs build ability. Crisp detailed moulding of complex structures. 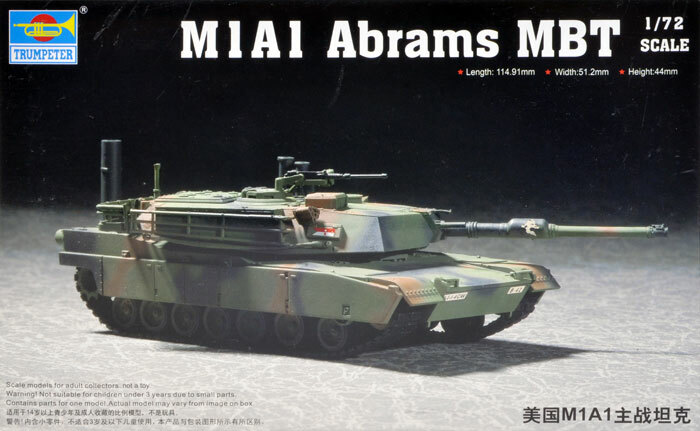 This is the third small scale ABRAMS kit I have seen, and whilst the box art does not really leap out and grab me, I would have to say this kit has grown on me. The M1 ABRAMS MBT replaced the venerable and reliable M60 Patton which was the final descendant from the ww2 era T26 Pershing/Patton line which spanned the M26, M46, M47 and finally the M60 MBTs. The original M1 ABRAMS was a quantum leap in technology and performance over the M60 and had far superior Speed, Fire Control and protection in the form of the British Developed Chobham composite Armour although it was armed with the excellent 105mm gun again of British origin. The original M1 and the IP (Improved production) M1’s were quickly replaced in service during the 80’s by the much improved M1A1 fielding the German 120mm Smoothbore gun and subsequently heavy Armour. The kit represents an early M1A1 before they were upgraded with the independent Commanders Thermal sights and a host of other External features. The M1A1 is used by the US Army, Australian Army (Later version), Egyptian Army and the USMC. The US Army is continually improving the breed and upgrading the family on a regular basis with improvements to target acquisition and Fire control, Communications, Command and Control, Armour and navigation systems. The kit comes well packaged in a small sturdy box with the one piece upper and lower hulls, 1 piece upper turret and detail parts enclosed in their own plastic bags with the Instruction booklet and decals. The instructions are clear, concise and follow usual Trumpeter layout with a view of sprue layout as is the norm these days. 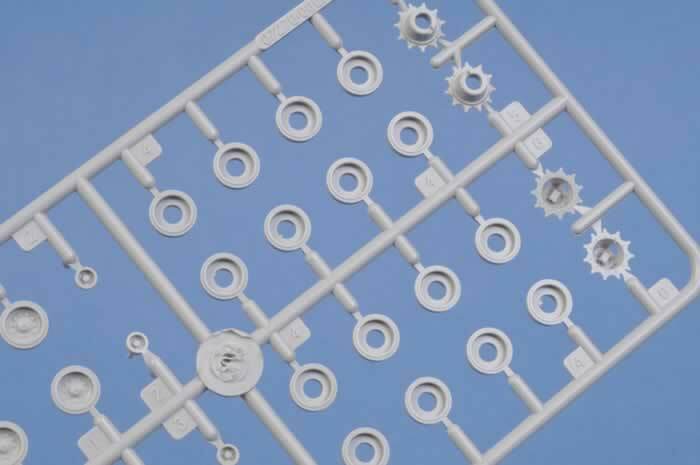 Trumpeter has the build broken down into 12 Stages and I have to say the breakup of parts and engineering is clever and requires minimal parts for maximum detail. Detail is restrained and adequate for the scale. The kit parts are flash free and quite crisp with most knockouts in out of the way places (Well done Trumpeter). 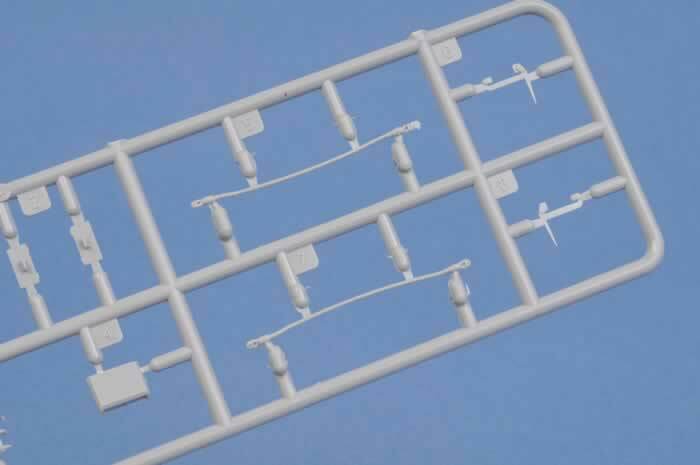 The lower hull is moulded as one piece as seems to be the norm in this scale with suspension arms fixed in place which would be a pin to reposition requiring delicate cutting away from the lower hull. The road wheels are moulded in two parts and I was impressed by the detail on the drive sprockets with lightening holes provided. The rear panel is a single well detailed mouldings to which may be added the option of a wading trunk. A small detailed towing pintle finishes the lower hull. The upper hull is a clever one piece moulding with the Side Skirts moulded integrally and done well. The only other parts to add are the two light fixtures and optional Wading trunks. The drivers hatch cover has open slots where the vision blocks would be but no clear moulding is provided for these. 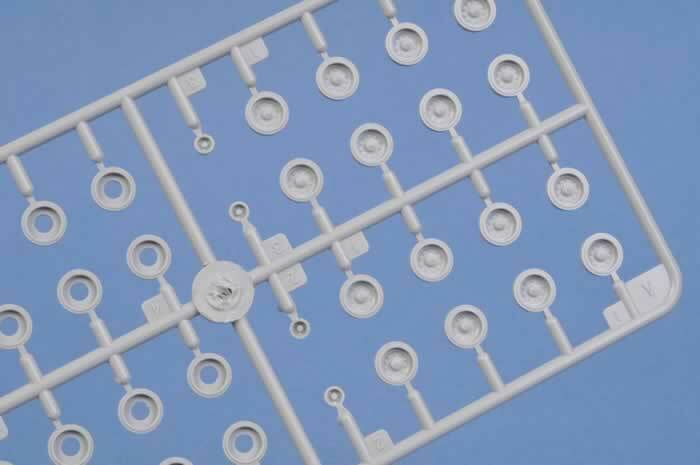 In this scale Crystal Clear or PVA glue would provide a glazing for these. 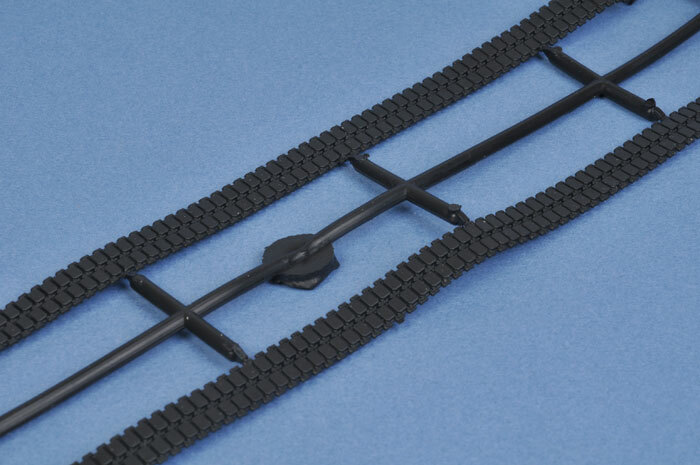 The tracks are vinyl and pliable with excellent detail on both the outer and inner face. They represent the later “Bigfoot” style of track. The turret is a clever moulding with most of the bins and loaders hatch molded in place. 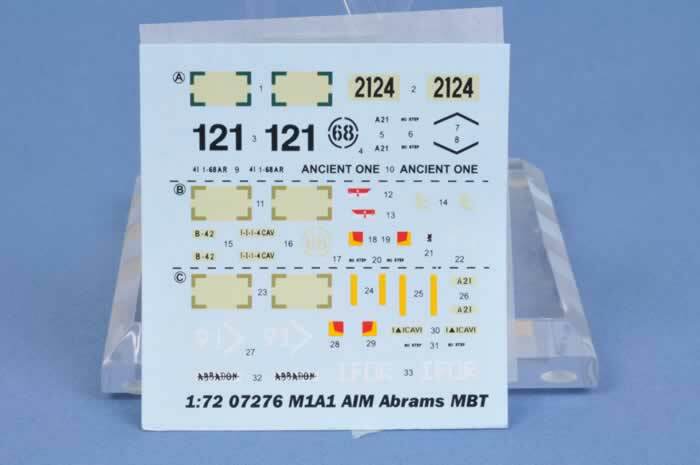 Unlike some other M1A1 kits this one has the correct later two piece Ammo bin blowout panels. The mantlet is a superb moulding in one piece as is the complex barrel. 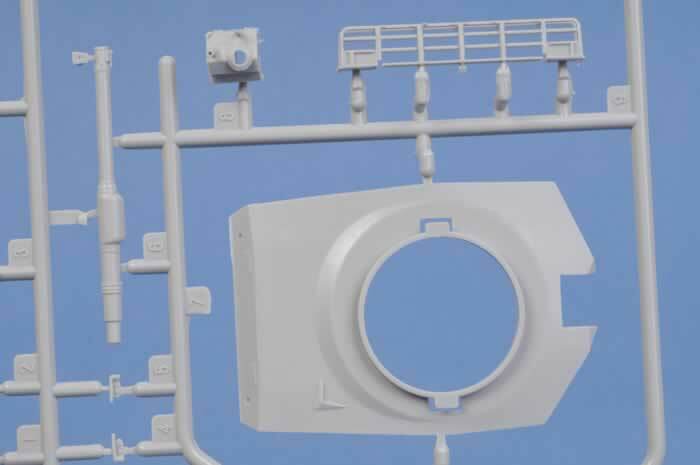 The majority of the Kits parts are now added to the turret in the form of the British Style Smoke dischargers, Wind sensor, Bustle Rack, Gunners primary Sight, Smoke grenade ammo bins, Tow Cables, Loaders and commanders MGs. 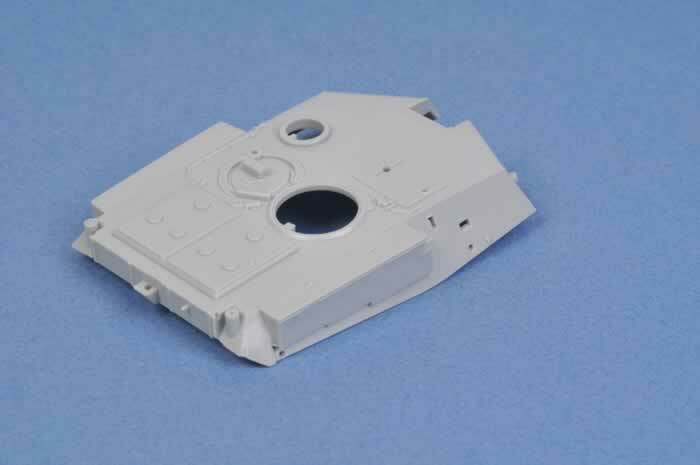 The Commanders Cupola like the loaders hatch is moulded shut. The rear bustle is a really complex one piece moulding and it asks the question as to why this can’t be done in the larger scale kits. The smoke dischargers supplied as mentioned are the British type fitted to the original Abrams MBT’s and are at odds with the Wading gear (commonly seen on USMC tanks which use a different type of smoke discharger. The markings are in register and options are provided for three vehicles: two in the NATO three Colour Scheme and one in Desert Sand. 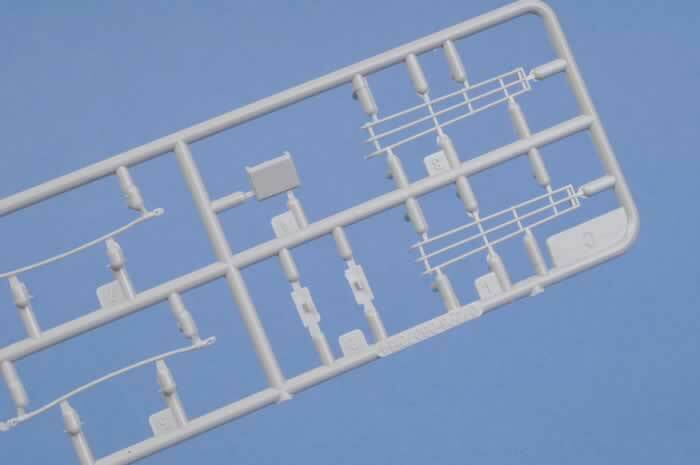 No information is provided as to user units and not all the supplied decals are mentioned in the marking guide. The second example is Marked with a Cavalry Flag with 4 over B and the speed numbers are 1-1-1-4CAV it has a small insignia on the barrel Evacuator of a Grim Reaper/Azrael ? (a copy of the WW2 German 11 Pz Div Ghost insignia). The third example is an IFOR vehicle and has a 91 as the hull number with large IFOR insignia. The speed number is 1Δ ICAVI and a barrel marking of ABBADON scored through is provided. In summary, this is a simple kit but does not suffer in detail. 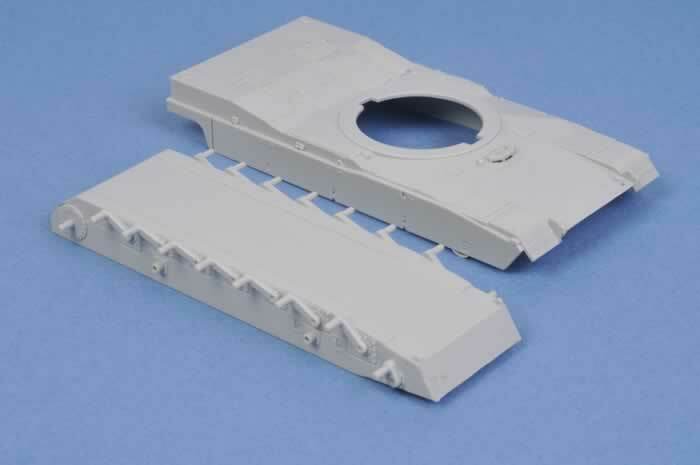 It is let down by the closed hatches and the single choice of Smoke dischargers but this kit will build into a great replica of an early service M1A1 circa 1990 (GW1). The standard of mould is very high and the one piece moulding of the complex rear wading trunk is amazing to say the least. The kit won’t challenge the builder but conversely it will not frustrate them and cause the kit to be unfinished or abandonded (think younger modeller here) It is an ideal subject for a younger modeller who has cut his teeth and wants a bit more but would also suit a younger modeller with a little help. The parts breakup indicate further variants of the M1 family are in the pipeline. 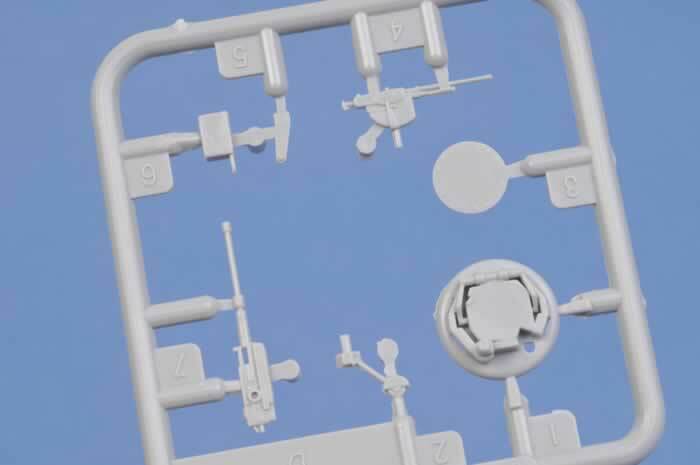 I’d recommend this kit for anyone wanting a small scale M1A1 but be aware this kit is limited to the early – mid 90’s.